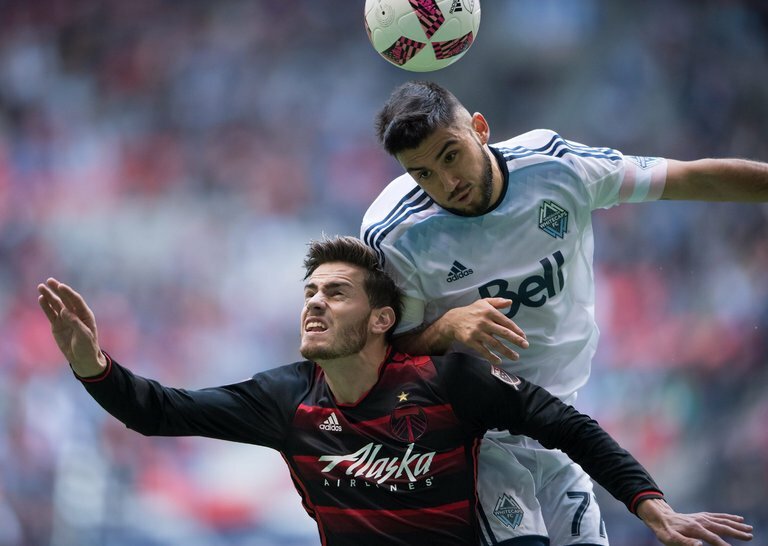 Portland’s Lucas Melano, left, and Vancouver Pedro Morales in Vancouver during the final day of the M.L.S. season. New York teams claimed two playoff byes and the league scoring title on Sunday in a furious finish to the M.L.S. regular season. With all 20 teams kicking off simultaneously on Sunday afternoon, the visiting Red Bulls defeated the Philadelphia Union, 2-0, to lock up first place in the Eastern Conference. New York City F.C. also claimed a first-round bye by virtue of its 4-1 win over the visiting Columbus Crew. The Red Bulls and New York City F.C. will play the winners of two midweek knockout-round games — Toronto F.C. against Philadelphia on Wednesday, and D.C. United against Montreal on Thursday — in the conference semifinals, with the Red Bulls playing the lowest seed remaining, and New York City F.C. playing the other. The winners from the knockout round will host the first game of the conference semifinals on Sunday, with the second legs scheduled for Red Bull Arena and Yankee Stadium on Nov. 6. The Hitter Can Hurl. The Hurler Can Hit. Can He Do Both in the Majors? NHL overreactions: Has Golden Knights&apos; magic run out? Can Maple Leafs&apos; offense carry them?